Do you ever feel like just a number when visiting the doctor’s office? It’s a common complaint by patients, further fueling the stereotype of practitioners seeming cold and uncaring. Healthcare professionals are left on the defensive, pointing to factors like growing caseloads, longer hours and staff shortages as reasons for bad bedside manner. Miami University sophomore Reagan Waddell, an aspiring physician assistant, understands current industry challenges but believes the stereotype bears truth. “I think there’s a problem right now of doctors seeing patients as cases rather than as people,” she said. Leading physicians and institutions worldwide point to training issues as the problem, pushing for the urgent return of humanities to medical education and practice. Cynthia Klestinec, director of graduate studies in English and an associate professor at Miami, is one of those calling for change. Klestinec conducts mock interviews with pre-health students and noticed that they struggle when asked about ethical and interpersonal issues. “It’s not that they lack empathy, it’s just that they haven’t been invited to think about those things critically, in the classroom,” she said. Staff at McCullough-Hyde Memorial Hospital work with a Miami University student volunteer (photo by Scott Kissell). After a yearlong study through Miami’s Humanities Center–– led by Klestinec and Kimberly Hamlin, associate professor of history and global and intercultural studies –– faculty wanted to develop a forward-thinking humanities program with courses that will encourage and sustain students. So, they created a new minor: medical humanities. With courses in history and philosophy as well as anthropology and English, the interdisciplinary track focuses on changing concepts and perceptions of disease, health, medical authority and patient experiences. Its coursework pushes students to understand the humanistic dimensions of medicine so that, one day, they will effectively communicate with patients beyond symptoms and a diagnosis. The courses approach the same issues with different methods. While some classes might look at how film and literature shaped the reception of certain epidemics, like AIDS, others dissect how themes of gender, class and race matter throughout the history of medicine and into the present day. Waddell, one of the track’s first students this semester, describes the minor as a new perspective on traditional material. She is currently taking the course Medicine and Disease in Modern Society. “The course allows me to see past disease and health as just the scientific definitions and see them as items that have a social impact,” she said. Health humanities tracks in higher education are rapidly growing. In Ohio, five colleges and universities offer related degree programs. “Medical schools looked at the deficiencies in their student populations,” Klestinec said. 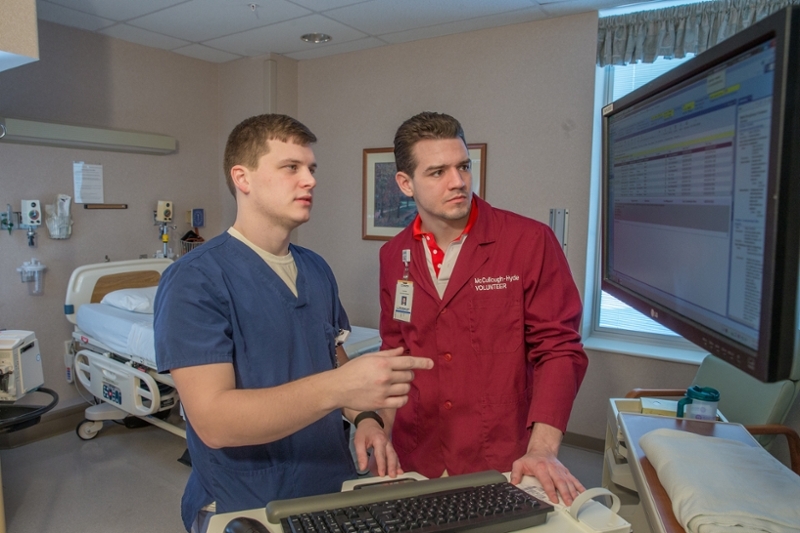 When prospective students go on interviews, they often complete clinical scenarios. Schools look for students with a solid grounding in science, but also for characteristics like compassion in patient interaction and the ability to recognize different perspectives. The Medical College Admissions Test has shifted to emphasize critical thinking skills, context-based learning and communication, which are gained in humanities courses. Changes to the entrance exam are even backed by the Association for American Medical Colleges. The group recognizes humanities as a critical piece in preparing health care practitioners to be proficient in core areas like cultural competency, ethical responsibility and critical thinking. 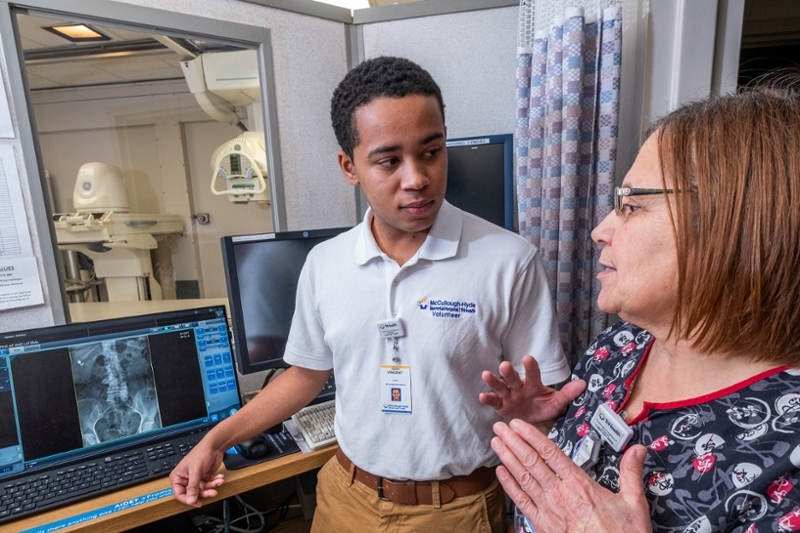 Miami University student Vincent Smith learns about imaging at the McCullough-Hyde Memorial Hospital (photo by Scott Kissell). Studies show patients who suffer from chronic conditions or terminal illness have better quality of life outcomes directly related to how practitioners interact with them. Klestinec looks to research at Columbia University where Rita Charon M.D. originated the program in narrative medicine. Charon directs practitioners in techniques that allow them to listen to their patients and fully understand their experiences, lifestyles and choices. Ariana Mack, a first-year public health major, hopes to incorporate those themes in her career. Mack wants to work for the Centers for Disease Control or the World Health Organization (WHO), coordinating the distribution of resources, responding to outbreaks, or helping to make decisions on how health interventions are implemented. She points to WHO’s definition of health, which includes the physical, mental, social and emotional. The medical humanities minor implemented core courses this semester, with faculty working to build a full curriculum around it. The minor is open to all students in addition to those interested in health careers.